Buyers can contact us for obtaining highly efficient Heat Exchangers! 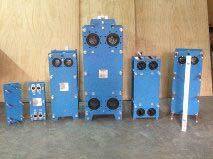 We also deal in high performance Heat Exchangers. Our products are manufactured using optimum grade raw materials and advanced machines. Heat Exchangers are thoroughly checked against various quality parameters and thus free from all sorts of defects. We have a wide Range of Heat Exchangers used in Food Industry, Heat Treatment, Oil Cooling and other different Industries.